In Chelsea Creek to Bunker Hill by Terri A. DeMitchell, young Andrew Beckett’s plans to study medicine at Harvard are scuppered when troops take over at Cambridge, Massachusetts. It’s 1775 and regions are embroiled in the dangers and battles of that troubled time as colonies and the British troops oppose each other. Then Andrew is sent by his mentor Dr Cutter to take supplies of medicines to troops, and finds himself involved in and witnessing the events that led to the conflicts around Bunker Hill. Terri A. DeMitchell writes a poignant and informative historical fiction for young adult readers. The writing is clear with explanations of the lead up to events. There is plenty of factual information of the situation of that time and, as fourteen-year-old Andrew’s story unfolds, how these events affected ordinary men, women and children. The fears and hopes of communities, feelings of conflicts of interest, and concerns to protect and find resolutions comes across well through the actions and dialogues of the characters. While there are many characters in the story, many are real historical figures, and the author has mixed fictional people in with these. This results in a very readable, informative and emotionally charged account of a period of American history. This is a book that brings history alive and provides young readers with plenty of themes and topics for discussion. It is an excellent example of how historical fiction can be used to capture the attention and imagination of younger generations as they discover and learn from the past. Chelsea Creek to Bunker Hill deserves a place in every home and classroom library. Chelsea Creek to Bunker Hill: Spring 1775 is an historical novel for young adults and preteens written by Terri A. DeMitchell. Andrew, Joseph and Jack are all young adults who have lived in Portsmouth and grown up together; however, the continuing hostilities between the British loyalists and the patriots have put any semblance of friendship among them under heavy strain. Andrew's family is mostly undecided; however, there are some leanings towards the aims of the patriots, and his older brother, Richard, had actually gone down to Cambridge when the town heard of the fighting there. Joseph, ever the hothead, had also gone off to Cambridge and is a fervent supporter of the patriots’ cause. Jack's family are loyalist and close friends with Governor Wentworth. Andrew's feelings about the ongoing turmoil are intensely personal; he had long harbored dreams of going to Harvard College to study medicine, and the news that the college had been closed down because of the troop buildup jeopardizes his plans to take the entrance exams and study there. 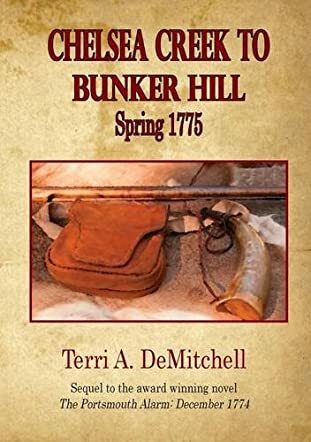 Terri A. DeMitchell's historical novel for young adults and preteens, Chelsea Creek to Bunker Hill: Spring 1775, is an absorbing and exciting recreation of the historical events that followed what was called the Lexington Alarm. This work is the sequel to DeMitchell's novel, The Portsmouth Alarm: December 1774. The author provides enough background information about the history and the characters to enable a reader to start with this book; however, I would recommend reading the books in order. DeMitchell deftly blends historical facts and personages with her fictional characters in this well-written and fast-paced story. I appreciated both her historical accuracy as well as her vivid depictions of the carnage and bloodshed that are the inevitable aftermath of war. Seeing these things through Andrew's eyes brings the struggles, sacrifices and ideals of the patriots to life. Chelsea Creek to Bunker Hill: Spring 1775 is highly recommended. Terri A. DeMitchell’s Chelsea Creek to Bunker Hill: Spring 1775 is told by Andrew Becket, a boy from a family hoping for a peaceful settlement between the patriots and the loyalists factions, following the events known as the Lexington Alarm. Andrew’s character is presented clearly from the start: he is deeply disappointed that he will be unable to sit the entrance examination for Harvard College. Cambridge, Massachusetts is overflowing with patriot troops intent on defeating those loyal to Britain and King George III. His ambition is to enter the medical profession and he already has the promise of studying with his mentor, local physician Dr. Ammi Cutter. Events move swiftly and Andrew is caught up in the grim reality of war. Chelsea Creek to Bunker Hill: Spring 1775 is a thrilling story that follows the adventures of fourteen-year-old Andrew Becket and his patriot friend, Joseph Reed. However, Terri A. DeMitchell opens with a preface which briefly outlines prior occurrences and points out which characters are fictional. The majority are not, and their actions during the spring of 1775 are well researched. That, together with an accurate representation of events, makes this a fascinating insight into part of a pivotal period of American history. Showing it from Andrew’s point of view allows the author to put over the fears, frustrations, and the courage of people with differing political opinions. Full of action, with well developed characters, this is a captivating story, and it would make a useful tool for any teacher: it is historical fiction recounted in a way that would trigger discussion in any classroom.